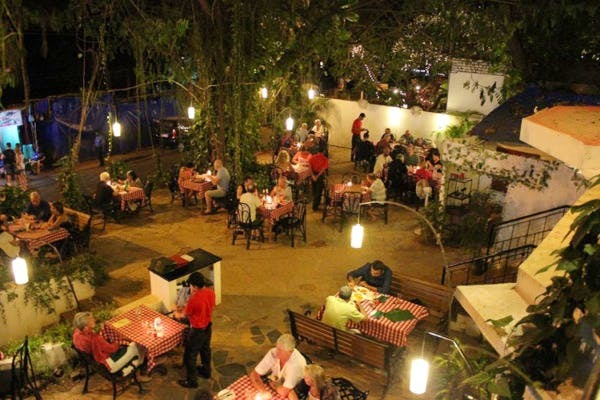 One of the best Italian restaurants in Goa, I’d recommend Tuscany Gardens for its lovely food and music, and authentic Italian food. Big groups, families, families with kids and couples looking for a romantic night out. Tuscany Gardens has outdoor and indoor seating; the indoor area has a bar as well, while the outdoor space is in a open lawn. What's Awesome on Their Menu? The ambience is the big winner at Tuscany. Backed with excellent and authentic Italian food, the menu covers salads, pizzas, pastas, a couple of mains and dessert. From the menu, I’d recommend their pizza giardiano, a hot bowl of zuppa, and pretty much all their desserts. The big winner on the desserts front are their pancakes with homemade orange ice-cream. I also found their service fabulous! Book your table in advance to avoid getting disappointed. Going on a date? Ask for a candlelight dinner.